I'd talk myself out of my own feelings because they seemed so out of place to where everyone else was. So I'd simply go along with it and only express my frustrations vaguely to a few select people in fear that my irritation was somehow "wrong." In the past few weeks, I've found myself experiencing some spouts of irritation. I kept finding myself with more and more things that I had to do, but with less and less motivation to do any of it. The demands of my part-time job, the demands of schoolwork, and other demands were causing this built up irritation. It was very difficult to admit to this irritation because, rationally, everything that I was doing was right. I was doing the things that I needed to do that would, theoretically, help me grow and achieve my goals. When I'd paint the picture logically, it'd flow perfectly and make sense. I mean, I was doing things that could help my own personal development and growth, so how can I not like that? This would then lead to thoughts of, "Oh but maybe if I'm resisting all of this so much then that means that I need to work on that more, right? I mean, that is what can happen during some personal and spiritual development activities." But the truth is that honestly, I was pissed off. I hated it. I hated doing all these things that I was being told to do. "Their" way didn't gel with me. Something was off and I was feeling like the alien because I felt like I was definitely not doing the same kind of process that everyone else was. I just wanted to do my own thing, in my own way, in my own unique process. The fact that I simply felt like I couldn't really do things in my own unique way and in my own unique time pissed me off. I felt trapped and I hated that feeling so incredibly much. This was so incredibly hard to admit to myself because, I mean, how can I really be angry over something that I, first of all, not only chose to do but, second of all, it supposed to help me? It was kind of like one of my earlier experiences where I found myself angry at a therapist (or two) of mine during my undergrad. I was very irritated and angry from working with her, but I had told myself to simply go along with it because "she's qualified to be helping me." Needless to say, trying to convince myself that it's okay and to ignore my own frustrations just caused more harm then good. Though we may not like our own anger or feel that, for some reason, it is not okay to be angry, pissed off, or hate something, the truth is that our anger can be the key to truly discovering the desires of our heart. It is by acknowledging our anger that helps us to see what it is that our soul is calling us to do so that we can take proper action and move forward. Allowing ourselves to feel our own anger and irritation can be the key to discovering what it is that our intuition is guiding for us to do next. If we allow ourselves to simply be mad and then take personal responsibility for it by taking action to help release that anger, then we allow ourselves to progress and move forward. So how can we acknowledge and release our anger so that we can become more in-line with our soul's true calling? 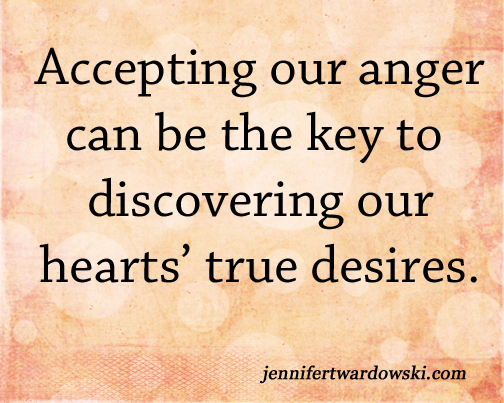 Acknowledge and accept that you are angry. Many times if we are angry and not acknowledging it, it is because we're telling ourselves some mental dialogue that it is not okay to be angry. We either don't want to express it or even allow ourselves to feel angry towards a person or the situation. 1. Check in with your body. Are you feeling a lot of extra tension? Do you feel kind of agitated in the body? If so, it could be representing some kind of anger. 2. Recognize the words you are using to describe your experience. Are you just saying that you're stressed? Are you saying that your frustrated? Sometimes we can use these words to describe our experience even though, deep down, we're honestly just angry. Allow yourself to really feel it and let it out. Know that it's okay to just vent your frustrations to others. It doesn't make you a bad person to let it out. Also, know that if there is any physical action that you can do to help release it then let that happen as well. Need to punch something? Punch a pillow. Feel the need to cry? Then just let yourself cry it all out. Accept what it is that you need to do to move forward and then do it! Are you angry at your job and it has helped you realize that you need to quit? Then do it! Are you angry at your partner or a friend for something they did? Then talk about it to make your frustrations known. Have you been angry about something lately? Make note of it and then ask yourself, "What do I need to do to help process this and move forward?" Share your thoughts below! Jennifer is a self and relationship coach and teacher. She helps women worldwide create fulfilling relationships and lives by helping their hearts' true desires to become a reality. Click here for her Free Self and Relationship Healing Meditation. Connect with her on Facebook. and Twitter!